As long time readers of my blog and my rants may remember, I once owned a Nokia 6233 which could schedule calls, i.e. have a calendar/todo/reminder entry for a phone call you wanted to make. When it was due, it would alert you, and you could - with only one click (on the green button) - make that call. Then came my Nokia E71, which was in all ways superior (and most probably the best Nokia handset I ever had), except for this: It simply could not schedule calls, and I could not find any 3rd party software for it. Now on my HTC Desire Z / Vision I again went on a quest for such a beast. Android doesn't have any stock reminder/todolist app at all, and none of the ones I saw so far, could handle calls (Astrid, Remember-The-Milk). Then I found Call Reminder (and more importantly Call Reminder Pro). It does exactly what I was looking for. 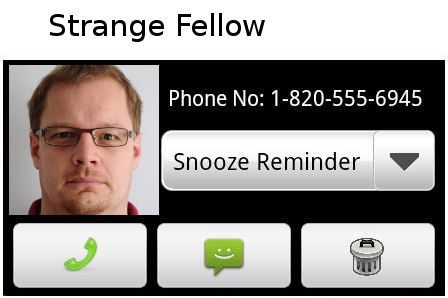 You can set a reminder for a specific call (number or entry from your contacts) and it will notify you then. Then you can call, snooze or dismiss this reminder. It also sends you a notification for every incoming call (or every missed call, this is a preference setting). So let's say you were away from your phone, and a call in the meantime that you obviously then missed. You will see the default Android missed-call logo and notification, acknowledge (and thus remove) it, get distracted and not return this call. Well, 30 minutes or an hour later (again depending on our settings) Call Reminder Pro will step in and remind you of this missed call, and what you want to do with it. This auto-reminder feature is really handy. Of course you can manually schedule calls (as noted before), you can change the time/date of the reminders etc etc. One weird effect is for calls you actually took: you still get a reminder. Sure you can turn this off. But ever so often you briefly take a call, tell the other party "I'll call you right back!" and then of course fail to do exactly this. So this is the one more case where Call Reminder Pro comes in handy. That's why I still keep it enabled for all calls, not only missed calls. Call Reminder comes as free (trial) version with limited features, i.e. you cannot manually schedule a call for any other day than today... annoying. So for only 1 buck don't even bother with the free version. And also, if you install first the free and then later the Pro version, you have 2 call reminder apps running, and get all the notifications twice (until you uninstall one of them)... As I said, don't even bother with the free version. Call Reminder Pro is worth its money. I've been using it for about 1 week know, and it already caught 3 calls I'd have otherwise forgotten. And at times, really annoying, because I might just be the 7th reminder for this call... with the voice box, maybe an text/SMS or email, etc etc... you know those guys.